In Megillas Esther, Haman (the villain of the story) describes the Jewish people as being "mefuzar um'forad," (scattered and dispersed). The second Aleksander rebbe, the Yismach Yisroel, explained that these words explain why the Jewish people reached such a low state that Haman was able to have success in his attempts to bring about their destruction. The Yismach Yisroel explains that the only reason why the enemies of the Jewish people are able to hurt them is due to the separation and baseless disagreement between Jews. 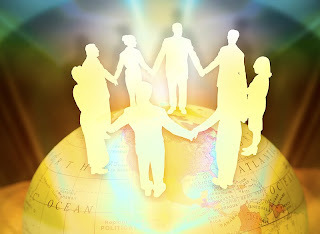 Because we are meant to be a people that rises above physical distrctions to have a complete revelation of the spiritual unity between all things, our most important communal value is achdus (unity). When we fail at this, we fail at the basis of our very existence. This Purim, I spent most of the day with the Aleksander rebbe, Harav Yosef Yitzchok Meir Singer. I arrived at his house for lunch at 12:30, and stayed until 4:00, and then went to his gathering at his synagogue from 10:00 until 12:30. 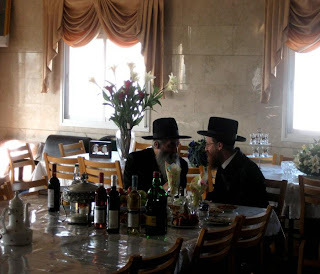 During the time at his house, as I sat with him and a few other Chasidim from Israel eating the meal, I watched countless people stream into the dinning room. Each person came not only to receive monetary donations, as this is the more than common on Purim, but to ask for the rebbe's advice on spiritual matters. 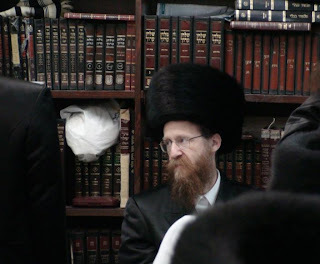 As Aleksander is a Chasidus in the tradition of Peshis'cha and Kotzk, there is no notion of the rebbe being innately holy, soaring in spiritual levels that are not reachable by the common person. Instead, he is seen simply as a person who, through his own self-discipline and work, reached a place that is accessible by anyone who dedicates themselves to self-transformation. Because of this, the rebbe makes himself very available to Chasidim and non-Chasidim alike, taking advantage of every opportunity to help others with their needs. The throngs of people who visited the rebbe were from all walks of life, reaching from Chasidish to those having no apparent religious affiliation at all. The rebbe even took time to meet with a woman who came for a donation to her particular charity. Whenever the flow of people dropped a bit, the rebbe would take the time to speak with those of us sitting at his table, telling stories, singing songs, drinking wine, and dancing to the holiday music being pumped through speakers in the house. The rebbe also took time to visit with his younger children and grandchildren who were running through the house. No matter who the rebbe spoke to, and no matter what issue was being discussed, the rebbe seemed to make sure that the person was treated as though they were the only person in the room. I once heard another story of the Yismach Yisroel regarding Purim. One Purim, while the rebbe sat eating his meal, a Chasid came into his house dressed as a woodcutter. The Chasid asked the Yismach Yisroel the follow question: "I am a woodcutter, and I have been working hard to cut a piece of wood, but I cannot cut it. Why is this? Is it because I am old and can no longer work with strength? Is it because the ax has become dull through years of work? " The rebbe responded to the question in reference to the Jewish people's struggle in the physical world. He said that spiritually, the two problems were the same. As time passes, and as we undergo difficulties in life, our physical strength weakens and our spiritual tools become dull. The rebbe then said that the solution to the problem is found in a verse in Megillas Esther: "Leich k'nois es kol HaYehudim," (Go, collect all the Jews). His response is that achdus, Jewish unity, seeing other Jews in a positive light no matter how negative the circumstances, and always working to help one another reach redemption, is the answer to our problems. Very interesting! I enjoyed this very much and agree that it was well written. What intrigues me and peaks my interest is your emphasis on unity. I certainly agree that it is a major key in the overall well being of any entity, whether the Jewish nation or the "local church." As a Christian unity is important to the "church", specifically the local church which is to represent the universal body of Christ. Unfortunately, a majority of the local churches have severely marred, if not destroyed the biblical injunction of unity. Many so called "Christians" do not take thier Scriptures literally or seriously. I apologize for this. I am looking forward to visiting your site frequently and even corresponding with you. I added your site to my blogroll.